romance – Your Life. Your Hustle. This is a paranormal romance that encompasses angels (both male and female) and the battles they wage against demons. Human females get mixed in with these heavenly beings and eventually romance ensues. It’s an easy read but has enough depth to it that you want to continue reading to find out what happens to the characters. It’s heavier on the paranormal than it is on the romance (although there is enough of it to satisfy romance fans). 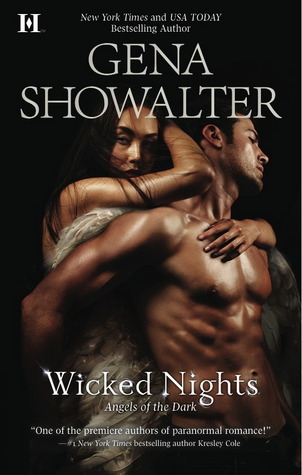 I enjoyed this book and am reading subsequent installments of the Angels of the Dark series. The other installments feature angels and characters mentioned in this book. I find that common with romance series; the building out of multiple characters within their own novels. I really like this method as often times I find myself intrigued by other characters and wishing for a side story … but the author dedicates an entire novel. By the time you are done with the series you’re pretty much an expert on everyone. Ties together nicely. Zacharel (main angel character) rescues Annabelle (main human character) from a demon that isn’t really after her …. he’s after Zacharel. It’s a plot twist that I didn’t see coming and thought it was very well done. I’m not going to give too much away. You’ll just have to read it. I have to chuckle a little bit at the covers on these types of novels. They’re a bit silly really. No where in this novel do the character stand around looking like that. I suppose that’s what sells these books to the main audience. This is the second book by Nalini Singh that I’ve had the pleasure of reading. The first was a novella from her Psy/Changeling series called A Whisper of Sin. Angel’s Blood is the first in Singh’s Guild Hunter series. I’m relatively new to reading paranormal; my previous experience consisting mostly of the Charlaine Harris’s Sookie Stackhouse series. This first book does an excellent job of creating a foundation for the rest of the series. It explains the roles that angels, vampires and humans (some special: hunters) play. I really enjoyed Singh’s adaptation and (small spoiler alert) how she made it that the angels create vampires in order to release toxins that their bodies develop (so that they themselves don’t get ill or turn into blood angels). The heroine (Elena) is a hunter and she’s not like a normal human (i.e. strength, can sense vampires, etc.). I like how she’s a strong lead without all the vanity and extra fluff. Kind of reminds me of Rodriquez in Avatar. Elena is nothing like Buffy The Vampire Slayer (ack … never cared much for that show — although I did like Angel) and seems more like the heroine in Underworld. A strong female who is focused and not easily deterred from initiative at hand, a professional. The plot of the story was well written and there is a surprise at the end (won’t say if it’s good or bad!). I really enjoyed how Singh was descriptive about the angel’s wings. Really painted a nice picture and the dust element was a nice touch. I will be reading the rest of the series (7 books and 4 novellas total). If you like paranormal than this is a good read. If you don’t like alternate interpretations of what angels are than don’t read this series; you probably won’t like it. This novella was a quick 90 minute read that moved the plot along quickly; which I suppose it would have to! It was the first book I’ve read on a tablet too:) This book was fun enough that I’ve now downloaded the first in Singh’s Guild Hunter Series. I’m not a fan of novellas because I feel as though the stories are too short and I want more. That being said this is one of 17 in the series so perhaps with them all pieced together a bigger picture could be formed. I’ll be sure to try a few more. The author did a good job of mixing in realism with the supernatural. I was pleased that the main character Ria (female) wasn’t a simpering idiot. The story did take on two points of view but there were holes in certain spots that left me wonder what happened. Near the end the main character Emmett (male wereleopard) went off to hunt down a “bad guy” and then came back wounded with very little explanation as to what happened or how. I get it…it’s more of a steamy paranormal romance in a shortened form which leaves a limited amount of room for plot and character development. This further cements my lack of interest in novellas but as I try novels from this author and if I find that I like them I’ll give the Psy-Changeling series another chance. I started this book with a basic understanding that it was going to be in the same genre as The Hunger Games and other dystopia type teen novels. It was no surprise that the main character of this book is a dejected, and somewhat whiny teenager. It felt as though every chapter was a repeat of the one before and one great big pity party. Intro the young attractive male who starts off being standoff-ish but later turns into her protector and hero … and of course romantic interest. A childhood bond is the only thing that makes the attachment believable. There were so many moments where I found myself skimming over the pages because they were filled with the white noise that was Juliette’s thoughts whenever she thought about Adam (and Warner); which was all the time. I found the descriptiveness of her thoughts to be over the top odd and just too random for my liking. A friend recommended this book because I had enjoyed The Hunger Games and The Twilight series (minus that last installment). This one missed the mark. I don’t think I’ll be reading the sequel novels. I’m not even sure I would recommend it as one of those brainless beach reads … you definitely don’t have to use many brain cells to read the book but it did give me a headache at times and lacked the excitement and intrigue I was looking for. Promising plot … just not executed as well. The book trailer also does nothing to grab my attention. Yes, I realize it’s just to promote the book and it’s not supposed to be like a movie trailer. It’s just like the book, only talks about Juliette and does very little to build the world in which she lives. As always, my hat off to the author for the energy and time commitment it took to create the series … it’s just not for me. First impression is one of boredom. I’m not really sure what the actual story is other than a memoir of a fictional character through the eyes of his friends and family. I’m not sure why I keep trying with Jane Green. I suppose it’s because I really enjoyed Jemima J. I did try her other works such as Bookends and Mr. Maybe which I could not finish. For the sake of this blog I WILL finish every book I start reading. After trudging through chapters of boring character building I was quite worried that I would have to set it aside for a few weeks in favor of something more engaging. Then I made it past the first hundred pages and there was a glimmer of a real story. I did have to roll my eyes a bit at how “hard” life was for these female characters who had au pairs taking care of their children. Interesting that the single people felt the married-with-kids people should go out and party constantly and just get a baby sitter for the kids. No wonder they’re (the kiddos) so happy about fixing a tree house ladder or having a stranger read them bed time stories. Yeah I know….it’s fiction…but it’s nice when there are more grounded characters like Olivia. I will say that the author certainly takes the “across the pond” to a whole other level. She loves mixing Americans and Brits in her books. She makes it seem like it’s no big deal to keep flying back and forth for the sake of meeting new people or going on dates. I guess that’s what New Yorkers and Brits do? The last quarter of the book moved fairly quickly through tipping points in each of the character’s lives. It seemed that everyone came to their senses post alcohol consumption. One moment everyone was at the brink and then the author fast forwards approximately eight months or so and updates the reader on where each of the characters ended up. It seemed like a rush ending and one of the more important characters was left out and a brand new one was introduced in the last few pages, with a fleeting introduction. Final thoughts on this book…it’s an okay beach read. Would I recommend it to anyone; probably not. Sorry Jane but another disappointment for me. Maybe Jemima J set the benchmark too high from the beginning or maybe it’s because I can’t relate with any of the characters.